What They Say.....From the creators of the groundbreaking documentary (and bestselling books) comes a four-week plan, showing anyone how to transition to a delicious whole-food, plant-based diet. The trailblazing film Forks Over Knives exposed an entirely new generation to the whole-food, plant-based nutrition revolution and inspired thousands to want to transform their diets, and their lives. 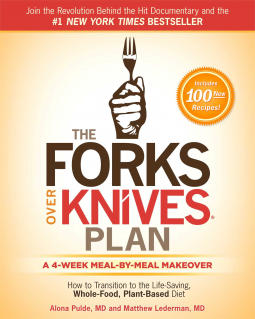 With so many people looking for change, the outstanding question became, “How can we put these dietary ideas into practice?” That’s what authors Alona Pulde and Matthew Lederman reveal in The Forks Over Knives Plan: How to Transition to the Life-Saving, Whole-Food, Plant-Based Diet—a clear, easy-to-follow plan that outlines the steps to take each week to transform your diet by cutting out animal-based and processed foods. What I Say....This book was an easy read, but it was a hard diet. It was supposed to be an easy to follow plan, but it felt unreachable. Normally, I say that the book is always better than the movie, but in this case, the documentary was better than the book. I know it wasn't because of the book, it was all in my head. However, my sister has followed their plan and is in the best health of her life. Skin is glowing, weight is great, she is more active than she has ever been, so I'm going to keep re-reading and trying to move down this path.